Reinforced concrete (RC) shear walls have long been recognized as suitable structural systems, providing both lateral resistance and drift control in RC buildings. However older shear walls were typically designed mainly for combined actions of gravity loads and wind loading with no special seismic load consideration. Seismic provisions were only introduces in the 1970’s, and have since evolved to ensure they have adequate capacity and ductility against seismic loads. In this article, I am, I will explore the evolution of design codes for the design and detailing of concrete shear walls. The design methodology for concrete shear walls in 1963 ACI code (ACI 318, 1963) is based on working stress design; however, an ultimate strength design approach was also introduced. Chapter 22 of this code required a minimum thickness of 6 in. (150 mm) for walls up to two storeys in height. This minimum thickness is increased by 1 in. (25 mm) for each 25 ft (7.6 m) below the top two storeys. This code requires an area of horizontal and vertical reinforcement not less than 0.0025 and 0.0015 times the area of the reinforced section of the wall, respectively. For walls more than 10 in thick, there should be reinforcement for each direction placed in two layers parallel with the faces of the wall. The minimum bar size was limited to #3 (9.5 mm diameter) bars spaced not more than 18 in. (450 mm) on centres. Around openings and at wall boundaries, there shall be not less than two #5 bars (16 mm). The minimum lap splice length required for reinforcement of Grade 50 and 60 should not be less than 30 and 36 bar diameters, respectively. The 1971 ACI Code (ACI 318, 1971) followed generally the same design and detailing requirements for reinforcement ratios and bar sizes as in the 1963 code, except that in Appendix A – “Special Seismic Provisions for Seismic Design”, the minimum areas of distributed horizontal and vertical reinforcement had to be at least 0.0025 times the area of the gross section of the wall. For shear walls with Pe/Pb < 0.4, (Pe, design axial load, and Pb, axial load capacity at balanced condition), additional vertical reinforcement was required near the boundary elements. The minimum amount of this concentrated reinforcement was 200bw.d/fy , where d is the distance between extreme compression fiber and the center of concentrated reinforcement and bw was the thickness of the wall. For walls with higher axial load levels, the amount of concentrated reinforcement had to be selected such that the wall could resist the combined actions of gravity and overturning moment. The reinforcing steel in the boundary elements had to be confined with transverse reinforcement over their full height. The minimum amount of required transverse reinforcement in the boundary elements was lh.ρs.sh/2, where ρs = 0.45(Ag/Ac – 1). f’c/fy, lh was the unsupported length of hoops, and sh was the spacing of the hoops. The minimum lap splice length of all vertical reinforcement was at least 30 bar diameters. The 1977 ACI Code (ACI 318, 1977) had the same design and detailing requirements as the 1971 code, except that the 1977 code introduced minimum lap splice lengths which were modified for different Classes of splices. where hc is the centre-to-centre distance in the horizontal plane of the confining ties, s and is the vertical spacing of the ties. The minimum development length for straight bars required by the 1983 Code was 2.5 fydb/√f’c which had to be modified in order to get the appropriate lap splice length, based on the Class of the lap splice. The 1989 ACI code (ACI-318, 1989) requirements for the minimum development lengths and the lap splice lengths changed significantly, by modifying the required lengths for the effect of cover, bar spacing, bar diameter, and the presence of epoxy coating. The 1989 ACI Code prescribed two different Classes of lap splices: Class A, where only 50% or less of the reinforcement is spliced; and Class B where more than 50% of the reinforcement is lap spliced. For Class A splices the lap splice length is taken as the development length, and for Class B splices the lap splice length is taken as 1.3 times the development length. However, the seismic provisions remained identical to the previous version of the code. Where, α, β, γ modification factors and account for the effect of bar location, bar coating, bar size, and the concrete density (λ taken greater than 1.0 for lightweight concrete), respectively. The factor, ktr, is the effect of confinement and cb is the maximum distance between bars. The seismic provisions for shear walls remained very similar to the previous version. Where λ accounts for concrete density (λ is taken less than 1.0 for lightweight concrete). The 1965 National Building Code of Canada (NBCC, 1965), subsection 4.5.8 requires a minimum thickness of 6 in. (150 mm) for concrete shear walls. The required thickness was 8 in. (200 mm) for basement and foundation walls. The minimum ratios of horizontal and vertical reinforcement for the walls were 0.002 and 0.0012, respectively. Special provisions for seismic design were introduced into Clause 19 of the 1973 CSA A23.3 Standard (CSA, 1973). The minimum ratios of horizontal and vertical reinforcement for ductile flexural walls were increased to 0.0025 and 0.0015, respectively. The maximum spacing of the steel was 18 in. (450 mm), but was reduced to 12 in. (300 mm) in the lower half of the structure. CSA A23.3 required a minimum thickness of 6 in. (150 mm) for bearing walls. Concrete shear walls more than 10 in. (250 mm) thick were required to have the uniformly distributed reinforcement in each direction, placed in two layers parallel with the face of the wall. Ductile flexural walls required to have concentrated vertical reinforcement near each end of the wall designed for the combined actions of gravity load and overturning moment. In this calculation, the overturning moment should not be less than the cracking moment. In no case should the reinforcement be less than 0.002bwd for intermediate or 0.0018bwd hard Grade steel or for Grade 60 (414 MPa) steel. No more than 50% of the concentrated reinforcement was permitted to be spliced at the same location. Lap splice lengths were required to be 1.7 times the development length. The CSA A23.3 (1977) was almost identical to the 1973 Code, except that metric units were used. CSA A23.3 (CSA A 23.3, 1984) introduced capacity design in Clause 21-Special Provisions for Seismic Design. 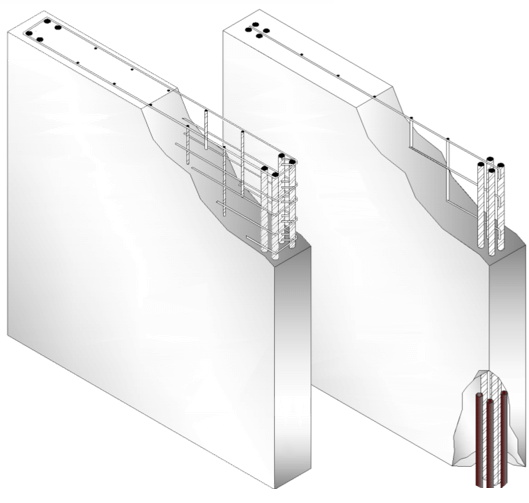 Brittle failure modes such as shear failure were avoided by designing the shear resistance of walls such that plastic hinging can be developed at the base of the wall. The length of the flexural compression zone in concrete walls without confinement reinforcement was limited to ensure ductile response. The boundary elements of the walls were detailed to provide confinement and to prevent bar buckling by limiting the spacing of the closed hoops around the concentrated vertical reinforcing bars. Using a performance-based approach, CSA A23.3 (CSA A23.3, 2004) requires an estimate of the concrete shear wall global drift arising from the design earthquake forces and then ensuring that the compression zone length at the base of the wall does not exceed a limiting length (Adebar et al, 2005). These provisions also recommend the minimum reinforcement ratio of 0.0025 for both the longitudinal and transverse uniformly distributed reinforcement. The spacing of these bars is limited to 300 mm for the plastic hinging region and 450 mm for other regions. The Code requires that the transverse reinforcement be extended and anchored within a region of concentrated reinforcement to develop 1.25fy . Concentrated vertical reinforcement, consisting of at least four bars shall be placed in at least 2 layers at each end of the wall. The minimum concentrated reinforcement shall not be less than 0.0015bwlw for potential plastic hinge regions and 0.001bwlw for other regions. The concentrated vertical reinforcement shall be enclosed by ties having a diameter of at least 30% of that of the largest bar diameter and detailed as hoops and spacing shall not exceed the smallest of 6 longitudinal bar diameter, 24 tie diameters, one half of the least dimension of the member or the tie spacing required by special ductility demands. To ensure the ductility, the current code requires the inelastic rotational capacity of the wall in plastic hinging region to be greater than the inelastic rotational demand. This entry was posted in Inspection and Evaluation. Bookmark the permalink.